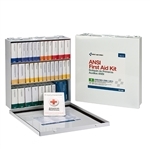 This 3-shelf, 1,092-piece industrial first aid station, is designed for medium sized businesses, offices and work sites and can act as a satellite first aid cabinet for buildings, wings or departments. Serves up to 100 people. The swing-out door and easy-to-carry handle add extra convenience. Meets or exceeds OSHA and ANSI Standard first aid fill requirements. The wide variety of first aid products are designed to handle first aid emergencies from burns, major bleeding and eye injuries to discomfort from minor cuts and abrasions. (1) M528: Antiseptic spray, 3 oz. First Aid Station Dimensions: 15"x16-1/2"x5-1/2"
westcoastmedicalsupply.com is your online source for first aid cabinets and industrial first aid stations for business and industrial workplaces. Rest assured that our industrial first aid stations from First Aid Only have all of the first aid supplies that you need to assure OSHA compliance and ANSI standards. Our industrial workplace first aid stations are a great option for a variety of workplace settings like construction sites, office settings, manufacturing facilities, childcare, restaurants, schools and much more.